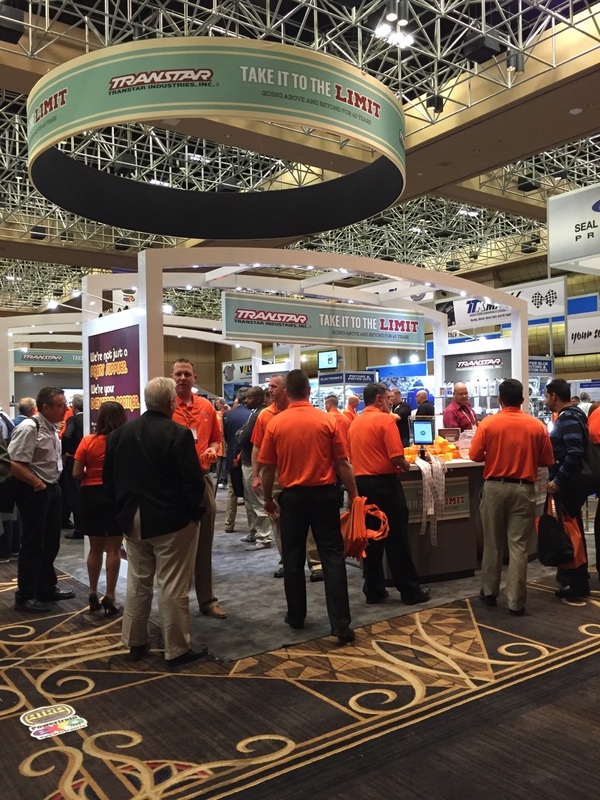 Transtar attended the ATRA (Automatic Transmission Rebuilders Association) Powertrain Expo in Las Vegas at the Rio All Suite Hotel and Casino on October 29 – November 1 of 2015. The Expo had 4 days of technical and management seminars, 2 trade show days, luncheons and a reception. Not only did Transtar host the reception, but they were also a main exhibitor, with their booth located at the entrance to the expo floor. GO2 was tasked with coming up with a campaign theme/concept and then designing various graphics based on the chosen concept. The client wanted the theme to be really fun, leverage the Las Vegas atmosphere and work well with the Eagles knockoff band that was playing at the expo. We chose the 70’s inspired theme concept “Take It to the Limit”. Working with a Senior Art Director, I designed an ad for the reception, 4 main panel booth graphics, supporting counter graphics and a wristband. Using our initial theme board for inspiration, I designed the four main panels to look and feel like they were made in the 1970s. Using bright colors, funky patterns and bold, bubbly typography, each piece feels unique but still a part of the same family. Imagery was used minimally to let the typography and patterns stand out as the main graphics. The teal stripe, Transtar logo and 40 years graphic are carried through each piece for consistency. GO2 Advertising was tasked with creating the strategic market research and planning, brand voice, logo design and digital platform for the LivingWise project by American Modern. LivingWise is an American Modern marketing and claims joint project, involving an associate built pre-fab home for claims adjusting training, that will give marketing a platform to showcase expertise in today’s trend of smart, secure and sustainable living. The entire project would be filmed from start to finish, and would be presented much like a video segment on HGTV. The branding elements that needed to be created were two logo designs, icons, social media, color scheme and some branding elements and textures that could be used throughout the project. When I began creating the logo, I wanted to make sure that the design supported the LivingWise three word tagline: Smart, Sustainable, Secure. The three main pieces of the graphic represent those three values, and show them coming together to form the house. The overlap of pieces shows that all three components work together to make the larger structure. The LivingWise type treatment is kept simple to relate back to the idea of sustainable living, with no fluff or unnecessary embellishments. The use of negative space in the logo mark promotes the idea of being green and environmentally friendly, reusing one thing to make another. The overall logo has a modern look and feel, linking it to the modern lifestyle being promoted by the entire LivingWise project. I decided to create two versions, a horizontal and an icon. I knew that the horizontal design would work best for web/print materials, while the icon version would probably work best for the video segments. Once the LivingWise logo was complete, I also had to design a logo for the LivingWise Guru. The “guru’s” refer to the LivingWise specialists and employees working on the project in the video segments. This gave the workers a fun, informative, approachable title with an air of expertise, and brings an added layer of personality and energy to the project. 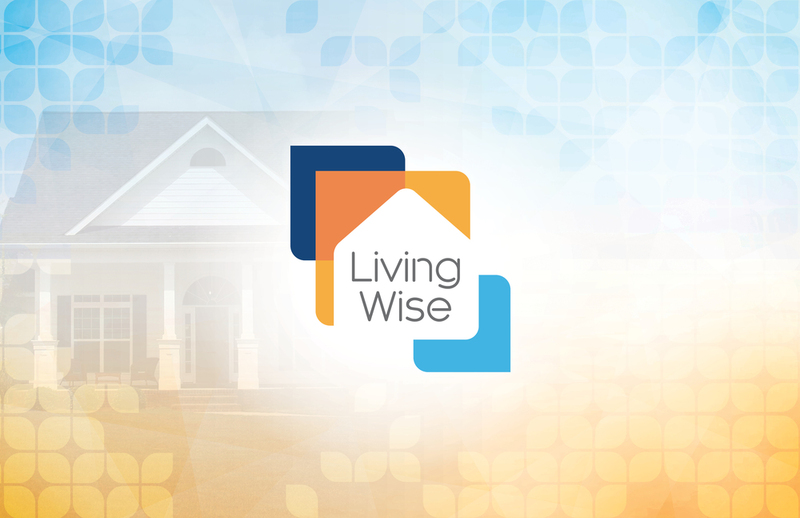 Once the branding was established, the interactive team developed the LivingWise blog. The blog follows the build of the American Modern pre-fab home, and offers articles that give readers ideas for living more inspired, innovative and informed. The blog also features weekly videos that follow the home’s construction and give tips on making smart choices when building a house. Although GO2 did not create the videos, elements of the LivingWise branding campaign were carried through into the video segments. Jack Cooper Holding Co. is transitioning to a single brand identity: Jack Cooper. They have been gradually taking steps internally and externally to complete awareness build in the marketplace. The goal of this project was to establish recognition as the full-service thought-leader, solution provider and strategic partner in the finished vehicle transportation category. The task was to design several signage pieces for their trade show booth and additional spaces at the conference. The signage consists of two 8’x8’ signs and four 3’x7’ retractable signs, as well as a full-page ad. 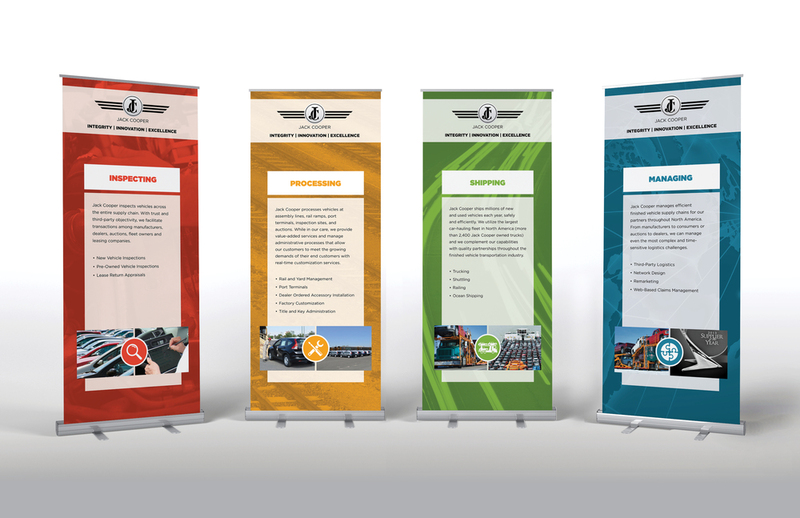 These pieces were used in the soft launch of the transition that took place at the 2014 Finished Vehicle Logistics Conference. Since this was going to be viewed amongst many other booth graphics, I wanted the design to be clean, organized and eye-catching. A color system along with a set of icons was established to represent each of Jack Cooper’s four major segments. Using a bright color palette and clean, sharp lines allowed the signage to be easily legible and noticed from a distance. The balanced blend of type and imagery allowed the viewer to digest the information without being overwhelmed by copy. The client was so pleased with the designs that they have now carried it through into their brand, and several elements are used on their website. GO2 was tasked with creating Sherwin-William's 2015 New Products Catalog. The client wanted the design to be simple since the reader was supposed to focus on the products. They also insisted that the cover include some type of a collage showing a wide range of the new products being featured. The catalog was 28 pages and introduced new items such as paint, tools, cleanup items, ladders, pressure washers and more. When I began designing the cover for the catalog, I tried to think of a new way to show a collage of products rather than just layering the products on top of one another. Knowing that the client was looking for simplicity, I chose to use a simple geometric shape as the main element in my design. Housing the featured products within a shape allowed each product to stand out more on its own. Using the hexagon shape worked well because each small unit linked together to form a larger unit. The blurred motion further accentuates this, showing that each item is coming together to create something bigger than itself. The simplistic style of the cover was brought through to the interior spreads, which allowed the emphasis to be on the products. While automated phone payment may not seem that exciting to the average U.S. citizen, it is a much more convenient alternative for Innovative service customers who reside on the U.S. Virgin Islands. The people living on these islands do not have their own personal mailboxes, and therefore they have to travel to the post office to send anything by mail, including their Innovative bills. With that in mind, this ad design shows how much easier and less time consuming the pay by phone feature is for these customers. The headline, “here’s the chill way to pay your bill,” focuses on the idea that you can pay your bill anywhere, anytime… even while chilling on the beach. The phone is the main focus, providing shade for the relaxed customer who is stress-free knowing her bill was paid on time. GO2 was tasked with creating Neebo’s 2014 Spring Rush Campaign. The client wanted to advertise their cheapest book price guarantee, and requested that the messaging be bold, short and in your face. The campaign featured Adam West and was advertised both on and off college campuses, with students being the target market. The campaign included banners, window clings, handouts, posters, table tents and more, while also providing the opportunity to have the graphics custom colored depending on the campus. Once the initial design concept was established, I was assigned the task of taking the concept and applying it across all mediums. Attention to detail and consistency was very important since there were so many versions of each piece. I also got the opportunity to visit the Cleveland State University bookstore to brainstorm new signage opportunities with Neebo. 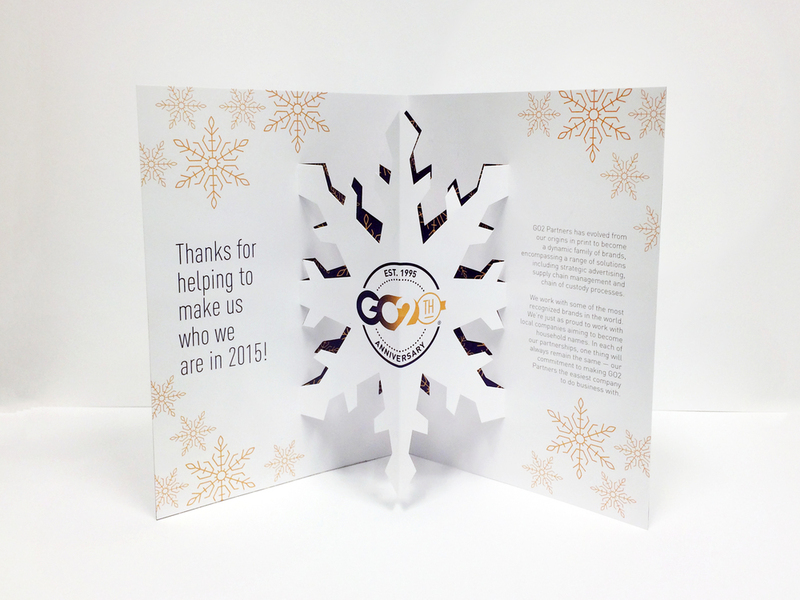 GO2 Partners was celebrating their 20th anniversary and wanted to create some different collateral pieces to honor it. 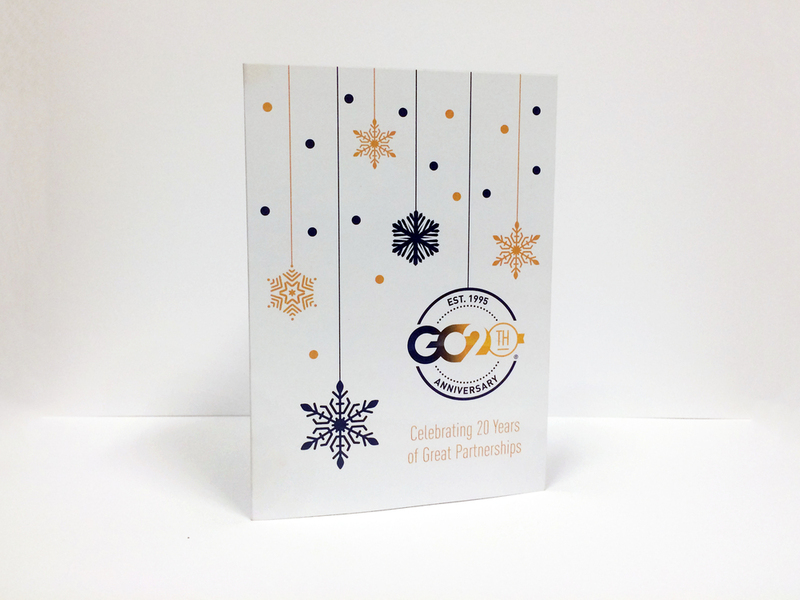 One of the tasks was to create a custom holiday greeting card that included the GO2 Partners 20th anniversary logo. They wanted to use the brand colors and convey a “winter” theme without focusing on one specific holiday. Working with a Creative Director, I was pushed to do something a little more inventive and outside the box than just a traditional greeting card. Since the theme was winter focused, I thought it would be fun to make a pop-up snowflake. Using the brand colors and various snowflake graphics, I created a festive card that highlights the 20th anniversary logo in a fun and unique way. This brochure is one part of a system designed to support Amcor’s booth at the 2014 Private Label Manufacturing Association trade show. GO2 was tasked to design a brochure introducing a•pex63™, Amcor’s new lightweight, plastic jar with metal lug closure. The piece speaks to a•pex63™’s benefits for both consumers and manufacturers. Aside from being shatterproof, these lightweight jars can also lower manufacturer’s shipping costs, and allow for significantly more product to be shipped at a time than traditional glass jars. Using existing brand guidelines and elements, I designed this brochure with the emphasis being on the product. I used several large images of the revolutionary jar, and included images with different fillings so the consumer could see how broad the reach would be. I also utilized infographics to display some of the comparative information, making the impact stronger and more noticeable. Amcor was in the process of creating a booth for the 2015 Pack Expo, and needed a full-page ad designed for the Packaging Industry News to support their space. Pack Expo is the largest packaging tradeshow in the US and this year Amcor invested more than ever in their participation at this show. The goal of this ad was to build awareness of Amcor’s presence, create interest in their innovative packaging products and drive traffic to Amcor’s booth. The booth itself was a modern home/condo complete with a working kitchen, bathroom, living room and cocktail bar. Within this environment, Amcor demonstrated how their packaging enhances people’s lives everyday. Amcor wanted the functional booth space to be the inspiration for this ad. This is why I chose to use a dimensional home as the main graphic for the piece. In a simple vector style, different items around the house are pulled out and highlighted, showing the wide range of products that Amcor has packaging for. I utilized the brand colors and product photos to tie the ad and booth together and make it easy to recognize once a customer arrived at the expo. Overall, the ad does a successful job of displaying the variety and usefulness provided by Amcor packaging. The advisory and consulting company BLK24 tasked GO2 with designing skins for an app they were developing called “OneTouch Law”. It is an app where consumers will be able to have a free 15-minute consult with a lawyer to determine if they need to retain legal services. The lawyers would pay to be a part of this service in an effort to build their practice, with the idea that most are new or smaller firms looking to get more business. GO2 had previously created the logo and color palette for the app, so the next step was to create skins that reflected these designs. I designed the skins to have a very simple, user-friendly interface to make the app easy to navigate. Since this was centered on the practice of law, I wanted to make sure it had a very corporate, professional look and feel, and didn’t appear too bright or flashy. I used the icon from the logo as inspiration for the style of the buttons throughout the app. The type treatments, graphics and overall interface maintain a clean, modern style that appeals to both lawyers and consumers. ProBuy is a bi-monthly catalogue of savings on paint, supplies and equipment offered by Sherwin-Williams. GO2 is responsible for creating each issue of ProBuy, and was asked to refresh the look of ProBuy for 2015. We began by evaluating current pitfalls and areas for improvement regarding layout and design. Overall design considerations included maintaining current budget and timeline, masthead design, callout system, current design trends and color scheme. 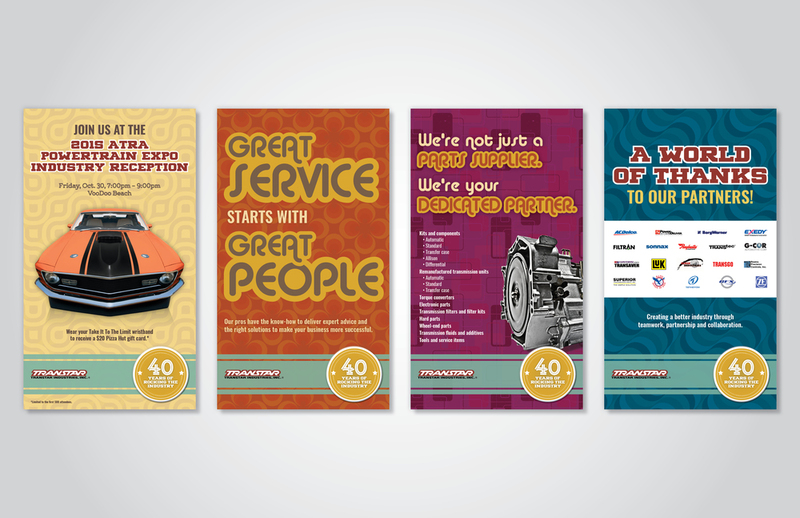 Working with a Senior Art Director and Senior Graphic Designer, our team provided several cover and inside spread options for the client to choose from. 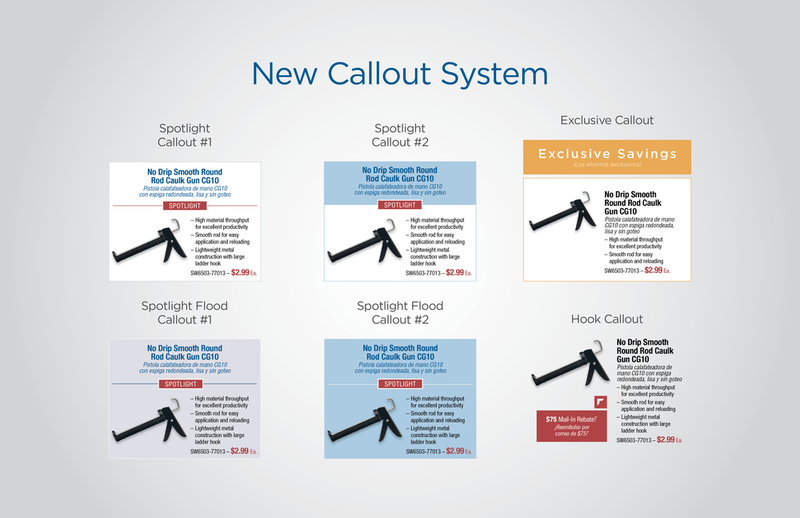 We created a new masthead, front and back cover design, callout system and simplified the overall design, making each spread feel less busy and allowing more room for products. Sherwin-Williams is working with ARCAT to develop a new online specification tool. A specification tool creates an automated process for writing specifications and guides the user through a selection tree of choices, drilling down into a final product selection. The selected products are formatted and exported for the spec tool in a variety of file formats. GO2 was tasked with the naming and logo design for this new tool. They decided on the name SpecExpress, highlighting on the user benefit of saving time and money while writing specs. The logo I designed is a symbolic articulation of the speed and ease that SpecExpress offers the target audience. The overall design is clean and efficient which equates strongly to the functionality of the program. I utilized shades of blue to relate to Sherwin-Williams and the calm ease of using the program. The design was kept modern and simplistic to attract the target audience, which consists of architects, interior designers, commercial reps and contractors. Innovative was losing customers due to competitive threats, outdated messaging and branding and huge service issues. The “I am Innovative” campaign addresses these issues while empowering customers and potential customers to be the hero. The task was to create various tactics that all ladder up to the “I am Innovative” testimonial campaign and strategy. This included print ads, static banners ads, radio spots, TV spots and direct mail pieces. One of the goals for this project was to keep old customers and obtain new customers through personal, relatable communication. Through the campaign the consumer should feel like they are being talked to by their neighbors, friends and family. I designed a direct mail piece that featured a woman speaking about her positive experiences with Innovative. While the mailer utilizes existing brand elements, they were tweaked to be successful for this specific piece. One of the challenges of this project was the hierarchy of the copy, and making the piece legible with a lot of condensed information. While working part-time as a Junior UI Designer at American Greetings in Cleveland, Ohio, I designed web graphics for American Greetings and Blue Mountain. These typically included homepage billboards that used existing card or product graphics, and banners that have correlating graphics for the page the user has clicked and arrived at. Photoshop was heavily utilized to manipulate photos and create realistic product images in different settings. Aside from web graphics, I also had the opportunity to create concepts and layouts for interactive applications. The Graphic Design faculty at Drexel University asked me to design the invitation for the 2013 Graphic Design Senior Show. I wanted the design to be simple but eye-catching, which I achieved using bright colors, clean shapes and bold typography. The design elements used in the invitation was then carried into a variety of other materials, including posters, cards, web graphics and more. Kelview Dobermans is a professional Doberman handling and breeding empire. I designed an identity system for them including a logo, business card, web graphics, merchandise, documents and more. I have designed several full page ads which have been displayed in the bi-monthly magazine, Doberman Digest, and I also manage the Kelview Dobermans website and Facebook page. I was approached by a law office to design an office brochure and graphics for their website. They have two office locations, one in Philadelphia, Pennsylvania and one in Marmora, New Jersey. This inspired their slogan, "Meeting all of your legal needs, from the City to the Shore". They needed a general office brochure to explain their services and provide contact information to new and potential clients. Using their existing logo and color palette, I designed a clean, modern brochure that speaks to their many services and benefits.